“I was the real thing once” claims the title character in Dan Fogelman’s misfiring dramedy Danny Collins (2015). Played by Al Pacino (who else? ), Collins was a once-promising folk singer who has leveraged his talent against a bleach-blonde trophy girlfriend, a vacuous mansion, and a limitless supply of booze and drugs. Whilst this may be far from a personally biographic account of regret and wasted ability for its star, it will be hard for fans in the audience not to be painfully aware of the similarities in much of the actor’s recent output. It’s impossible not to project his crooning cringe-worthy No. 1 hit Sweet Baby Doll onto the “hoo-ha” bombast that equally drowned out Pacino’s nuanced artistry. However, this is certainly not that kind of Pacino performance. This is the tale of man whose life has become a stream of dissatisfaction and indulgence, suddenly awoken from his slumber by a letter given to him as a gift by old friend and manager, Frank (a straight-talking Christopher Plummer). It was sent to Danny forty years earlier by John Lennon, offering support and advice. It never reached its intended recipient, though, and his career proceeded to become one long soulless money-grab. Now he’s shaken up and seeks to relight his creative fire and reconnect with his estranged son, Tom (Bobby Cannavale). In the process, Dan Fogelman – who both wrote and directed – manages to straddle creaky rom-com, abundant sentimentality, and some surprisingly touching emotional beats. Danny’s romantic entanglement takes the form of Annette Benning playing Mary, the manager of the hotel in which he secretes himself to write. Fun is poked at the inappropriate age disparity – even while she is presented as the more suitable option – and the script aims for quick-fire patter; but Aaron Sorkin this ain’t. Benning fares well and there several funny moments, but Pacino never quite manages to excavate the real charisma beneath Collins’ tanned veneer. There’s a scene in which Danny plays a song to Mary – the first he’s written in decades – and it’s far from inspiring. She hardly knows where to look or what to say, and for the comedic sequences the audience may well feel the same. It’s not awful, just artless and charmless. What absolutely works is the nascent relationship developing between Danny, Tom, his wife Samantha (Jennifer Garner), and daughter Hope (Giselle Eisenberg). While this particular narrative strand is strewn with contrived melodramatic plot twists, Pacino, Canavale, and Garner all shine, injecting their scenes with considerable pathos. Pacino plays Danny with a persistent and overbearing bravado in these scenes that grates until it becomes apparent as a coping mechanism. Opposite Cannavale his true colours do finally out in a conclusion that is actually somewhat unexpected and undeniably moving. 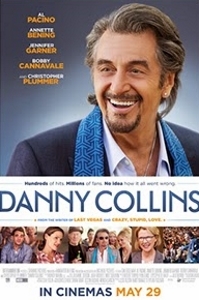 It is just a shame that much of Danny Collins feels like the falcid numbers its lead belts to blue-haired octogenarians in the front row, when it is evident just what the film, and more importantly Pacino himself, are actually capable of.